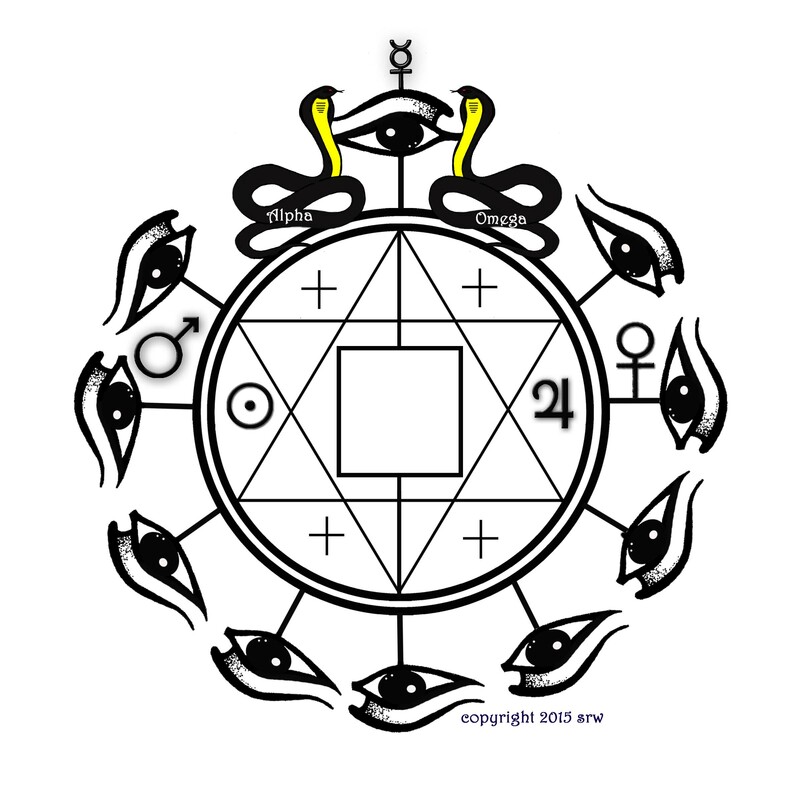 Eyes of Spirit — Sigil for Manifestation — Write a goal in the center of the sigil. Call upon the Planetary Powers to assist you in your working. You can use this sigil in your Joy Jar that you will create today. Every day you must throw something away! Light a Yellow or Gold Candle to bring Leo Moon energy into your day! Light a Red candle to bring Mars energy into your workings! Welcome! Welcome! To this year’s Great Release Program! Every day you will see a header like the one above — this gives you the information fast. Today is all about “3’s”! Today’s Challenges — Begin your day with the Braucherei Morning cleansing and empowerment exercise (please view previous post), followed by practicing this week’s theme — Clearing Your Mind — where each day you will practice replacing negative thoughts with positive ones. Think of something you love — and hold onto it as long as you can each and every time a negative, fearful, or worry filled thought crosses your mind. When you have finished with this week’s theme exercise, move on to today’s fun activities! What is my Release Goal this year? What is my motivational statement? You can write any statement you like. Use it as often as possible. Once you have your statement written and you are satisfied with it — stand in front of your mirror and repeat the statement to yourself three times. Yeah, I know, sounds dumb — but, it works! Look right into the reflection of your eyes and sincerely repeat that statement every morning for the next thirty days. I bring joy into my mind. I bring joy into my body. I bring joy into my spirit. No matter what I need, it will come easily to me! Each day, add three coins to your Joy Jar! When the Great Release Program is over, donate the coins to your favorite charity — then begin again! Your Joy Jar can be as simple as this canning jar, or you can choose something far more ornate — it is entirely up to you! You can use your Joy Jar throughout the program whenever you feel you need a little boost in your life. 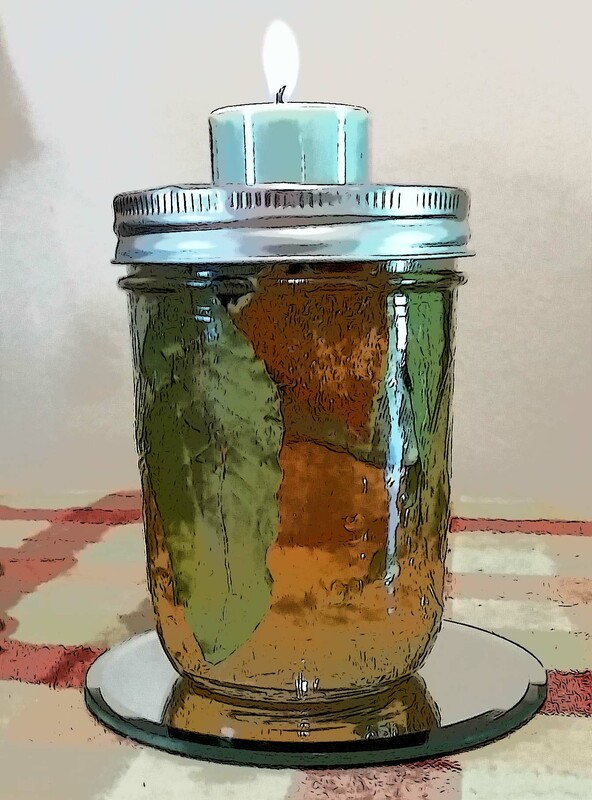 Just add a tea candle (as shown) or taper candle in a holder on top of the jar, empowered for your desire. The 3-Minute Throw!! Using a watch to keep track of time, see how much clutter your can remove in three minute bursts! Have a race with your spouse, significant other or your kids! Who can remove the most junk in the shortest amount of time! If they complain, explain to them that the Universe can’t allow you to manifest new stuff if the old stuff is in the way! Practice the 3-Minute Throw several times. The 3-Minute Clean!!! Using a watch to keep track of time, see how much you can clean (remove dirt, grime, grease) in three minute bursts! See who can get surfaces the cleanest in the shortest amount of time! Remember that dirt and grime hold negativity! Practice the 3-Minute Clean as many times as you can! Throw One Thing Away!!! Yup, no giving or donating this week. THIS WEEK is all about getting stuck, broken energy out of your living environment. As long as you throw one thing away EACH day through the end of the program, you will have successfully completed this year’s challenge — all the rest is cake! 3-Minute Deep Breathing!!! Gotta have it. The Magick is in the breath! Close your eyes, breathe deeply. Pull energy up from the ground, into your feet, up through your heart, into your head, down back into your heart, and out through your hands. The more you practice the better you get! Eventually, we’ll add a focus; but, for this week, let’s just practice breathing deeply and running energy through your body. 3-Minute Walk Through!!! Right before you go to bed, walk through your living environment, taking note of what you feel needs to be moved, removed, enhanced or completed in the coming days. Write yourself a reminder if you like. Pick up anything that wandered out of a corner and plopped itself in a space you already cleaned or cleared. Pay attention to that area — it is magnetized. Tomorrow, clear that space with a chant, prayer, or incense. If it continues to “collect” consider how you can use this collection point to your best magickal advantage. Before You Fall Asleep: Right before you fall asleep, cast a circle in your mind around your bed. Finish with: “Peace with the Gods, Peace With Nature, Peace Within — Only the Good Remains” statement. Sleep well and see ya in the morning! Silver RavenWolf – 2015 Great Release Challenge! Various colored candles. White is okay. We’ll use them on different occasions. Preparation: Find a place where you will not be disturbed. As the ritual only takes about five minutes, you won’t need to lock yourself in the attic. I know, though, what it is like to be a busy person with family members assuming its okay to interrupt you just-any-old-time. So! If the only place you can find peace is the bathroom while taking your morning shower — that’s okay! Just lock the door. The beauty about Braucherei is that you whisper instead of speaking in a normal voice. With the water running? No one will hear you. Step Two: Intone the following chant nine times — if you are super pressed for time — three repetitions will do. Step Three: While you are still facing East — intone the Planetary Powers chant 9 times. Three if you are pressed for time. What to do with the water? If you have nothing to it — you can drink it. You can give it to your plants, use it to bless objects in the home or work environment, or take it outdoor and pour it on the ground as a libation to the Gods — your choice.